Who can guess what is in this yellow toolbox in my living room? If you guess correctly, a fabulous prize will be awarded to you! I promise, not only are the contents interesting, but the prize will be good! 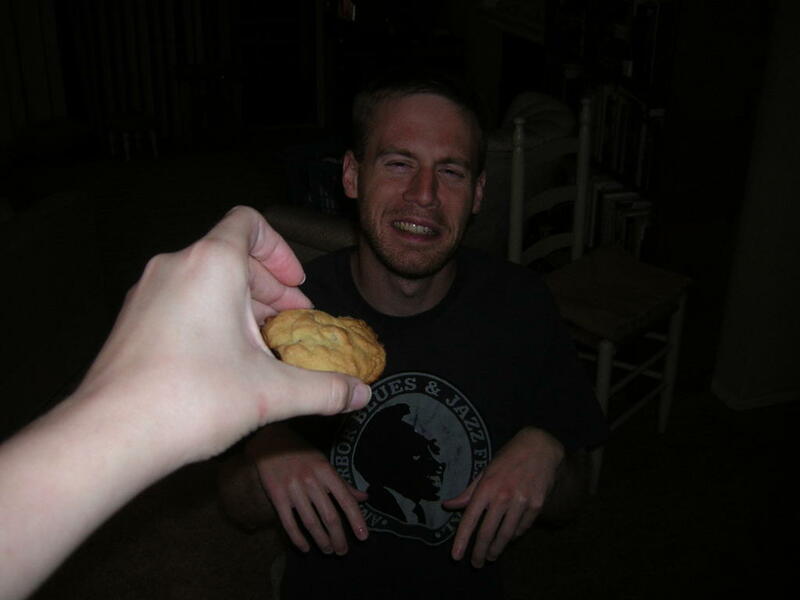 Mike and I decided that we should go out on a "date" together tonight. Ok, so I decided and he agreed, but either way we ended up going out to dinner. Now, it is official that we are old. How can you tell? Well, it's 9:05, and we're already back from dinner, and have uploaded pictures from tonight, thats how. 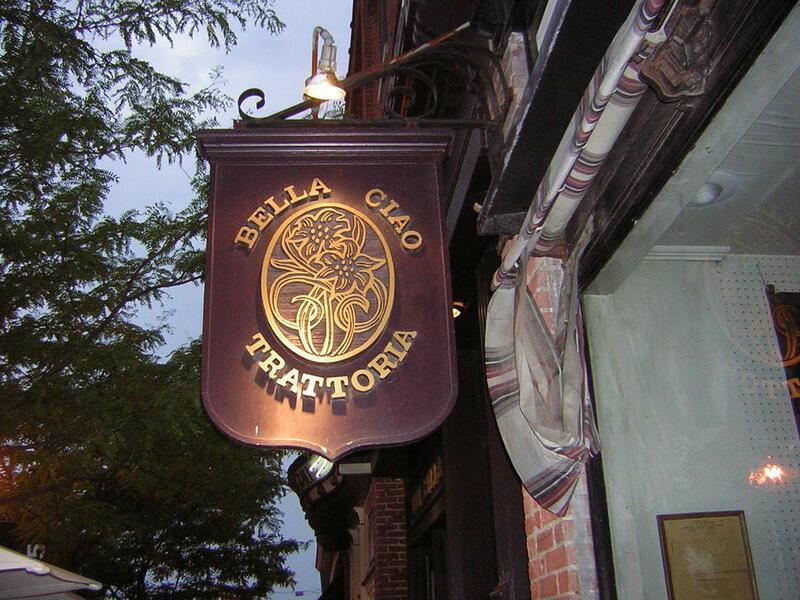 We went to a great italian restaurant Bella Ciao (which is confusing to me because one of my favorite restaurants in my old neighborhood is Ciao Bella). 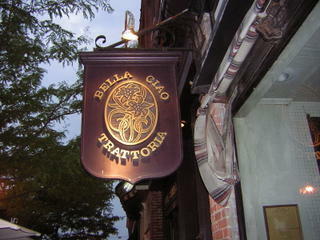 Pictures posted below are of the restaurant, and a "fairy" door. 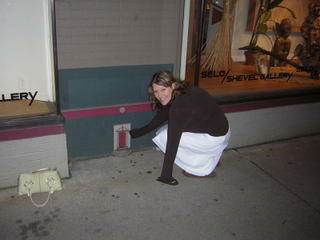 These teeny tiny doors are stashed around the downtown area for people to try to spot as they walk by. 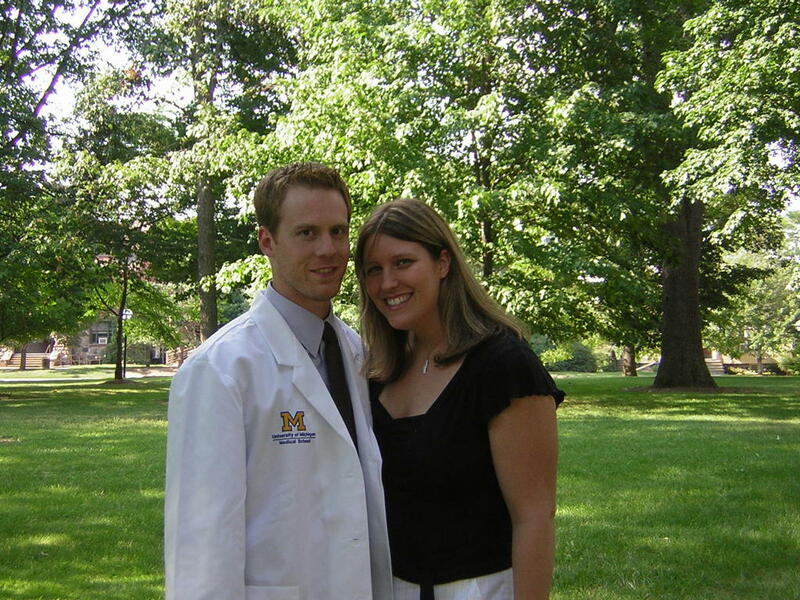 On Sunday afternoon Mike had the White Coat Ceremony at the University of Michigan to signify his officical entry into medical school. I was happy and excited for the day, as were his parents and grandparents. Mike was less than impressed with the entire ordeal, but all in all it was a very nice ceremony and at least we got to take some good pictures of the family. Well it appears that I have only 1 box to unpack!! Of course, there is alot of final putting-away and rearranging that must take place, but at least my battle with the 128 boxes will be over. I am happy to report that everything seems to be fitting into the spaces provided...all of the clothes fit in the closet (barely) and all of the kitchen items can actually be in the kitchen, etc. Normally I would take my time and put everything away, including hanging pictures, in their proper places over the next week or so, take my time and decide where everything should be. There is however a slight problem. 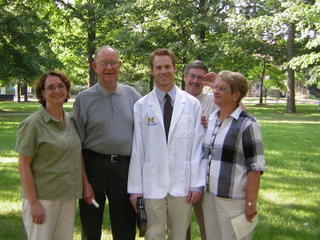 Mike's parent's and grandparents are arriving tomorrow afternoon to be here for Mike's white coat ceremony on Sunday. AHHH! No of course, I could leave everything as it is, they know we just got our things last Friday, but I've never met them before. I don't want them to think that I like to live that way, because I most certainly don't! So for the next 24 hours I'll be in a constant state of decorating. Speaking of decorating, I ordered a very cute 4 x 6 rug from Anthropologie that was on clearance for only 29.99 -- a steal as the original price was 168--. It arrived and I opened the package rolled out the rug and was suprised to see they had sent me, not one, but TWO rugs...shall I return, or shall I keep (they only charged me for one)? Hmmm. We have successfully unpacked a good number of boxes, i.e. all of the living room and spare room. We have yet to tackle our clothing, bathroom and misc. boxes. Last night I dreamt that we had boxes with pink tags (strange, since ours are blue) and they were just sitting there waiting to be unpacked. Maybe thats because the first thing I see in the morning and last thing before bed are boxes...I. MUST. UNPACK. 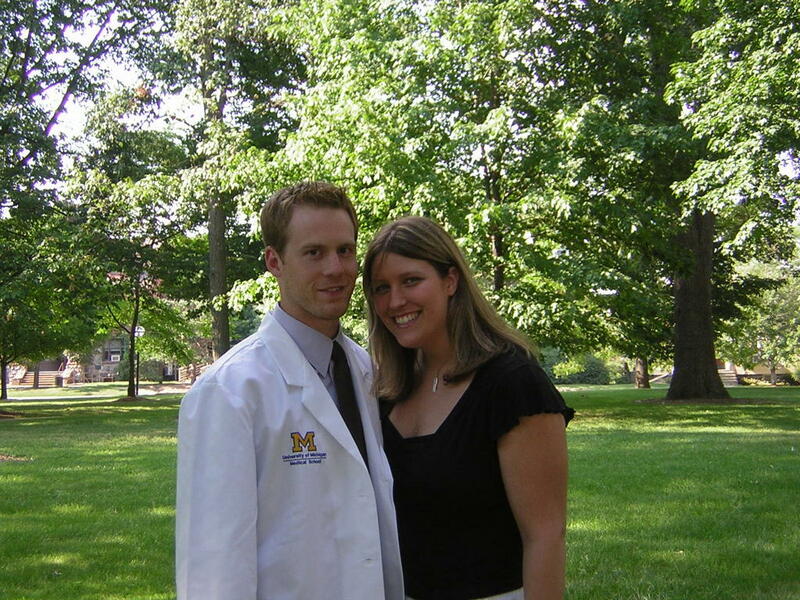 Mike started his 1st day of medical school today. They sure don't let them ease into the process, he had to be at school at 7:30 this morning to start orientation. This week is going to be filled with a lot of general information, team building exercises and some activities for getting to know one another (including those that he can bring me to). He is less than thrilled about going to these activities, but I am excited! I can't wait to meet some people in our area that are in the same situation that we are. It would be nice to meet a couple of people we could go to dinner with, or out to movies, etc. 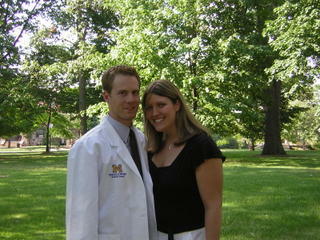 My instructions to him as he left the house today was: No nurses, be nice, and find us some friends.